Patrick Quirke arriving at the Central Criminal Court. A FARMER ACCUSED of murdering his love rival told gardaí he had a “hunch” about what happened to Bobby Ryan and found the things the deceased’s girlfriend told him “strange” and “intriguing”. In interviews following the discovery of Ryan’s remains Patrick Quirke also told gardaí that Mary Lowry, Quirke’s former lover and then-girlfriend of the deceased, had a “couldn’t-care-less attitude” about the disappearance of her boyfriend. Quirke (50) of Breanshamore, Co Tipperary has pleaded not guilty to the murder of Ryan – a part-time DJ going by the name Mr Moonlight – on a date between 3 June 2011 and April 2013. His body was found in a run-off tank on the farm leased by the accused and owned by Ms Lowry at Fawnagown, Tipperary in April 2013. The prosecution claims that Quirke murdered Ryan so that he could get back with Lowry (52) with whom the accused had previously had an affair. On 30 April 2013 gardaí were alerted by Quirke’s wife Imelda to the presence of a body in a tank on Lowry’s farm. 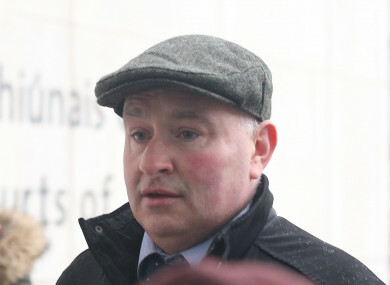 Inspector David Buckley told prosecuting counsel Michael Bowman SC that he met Quirke at the scene and asked him to accompany him to Tipperary Garda Station to make a cautioned voluntary statement. Quirke agreed to go and did not want to speak to a solicitor. In the interview Quirke detailed how he found the body, saying he was trying to empty a slurry tank and needed more water as the slurry was too thick. An open tank that he would usually draw water from was empty but, he said, he knew water had been leaking into the underground tank beside the milking parlour. He had not opened this tank since 2008, he said, but knew it was there because the previous owner of the farm, Martin Lowry, told him about it. Covering the tank were two concrete slabs so he prised one of them aside using a shovel and put a suction pipe through the gap to draw whatever water was there. He was “shocked”, he said, and phoned his wife Imelda who arrived, confirmed it was a body and phoned her friend Garda Tom Neville. He said he called his wife rather than gardaí out of “instinct” and because he wanted someone to confirm what he had seen. Garda Buckley put it to the accused that he was “fairly clean for a man doing a dirty job”. The accused replied that he was “only getting into it” when he made the discovery. He said he was not jealous of Bobby Ryan and didn’t take issue with the relationship he had with Lowry. He didn’t disapprove of it and there was no animosity between him and Ryan. He said he had to “take it on the chin” and denied ever having heated words with Ryan. He told gardaí that he chose to meet him and Lowry socially, something he wouldn’t have done if he had a problem. He met Ryan three times in total, he said and had never been alone with him. The first time was at Hayes’s Hotel in Thurles. He later attended a Brendan Grace gig with Imelda, Lowry and Ryan and met him on another occasion at Killough Quarry where the deceased worked. While the relationship with Lowry ended badly he said he wanted to keep it friendly as she was family, having been widowed by Quirke’s brother-in-law. He denied having any role in Ryan’s body being in the tank and said the only things he knew about Ryan’s disappearance were the things Lowry told him, like how she couldn’t be clear about whether it took ten minutes or two minutes for Ryan’s van to leave her driveway the morning of his disappearance. He also asked how she found Ryan’s van so quickly later that day in the car park leading into Kilshane Woods. He wondered why, when she was looking for Ryan, she did not travel along a route he would normally have taken but instead drove to the local beauty spot where she found the van. The deceased’s daughter Michelle Ryan has previously told the trial that it was her idea to travel to Kilshane Woods as she had a “terrible feeling” she was going to find her dad’s van in a woods. Quirke also asked about how she saw Ryan’s van as it would not have been visible from the road. “I found it strange,” he said and later said he found it “intriguing”. She had a “couldn’t care less attitude about it,” he added and recalled an incident when he urged her to speak to someone he believed had evidence relating to Ryan’s disappearance but she didn’t. Gardai also asked Quirke why he did not tell them about the tank in 2011 when they were searching for Ryan. He said he didn’t think of it and thought it was “laughable” when gardai asked him to empty tanks on the land as part of the search. Firefighter Bernard O’Brien told David Humphries BL for the prosecution that he and nine colleagues retrieved the body from the tank by sliding a sheet of tarpaulin underneath it. Those getting into the tank used breathing apparatus and a chemical suit. The witness told Lorcan Staines SC for the defence that it was more complicated than taking a body from a river or lake because of the confined space. Looking into the tank he said he could see the rib cage with no clothing covering it. He added that there was no pathologist present when they removed the body. Email “Murder accused told gardaí woman had a 'couldn't-care-less attitude about boyfriend's disappearance'”. Feedback on “Murder accused told gardaí woman had a 'couldn't-care-less attitude about boyfriend's disappearance'”.